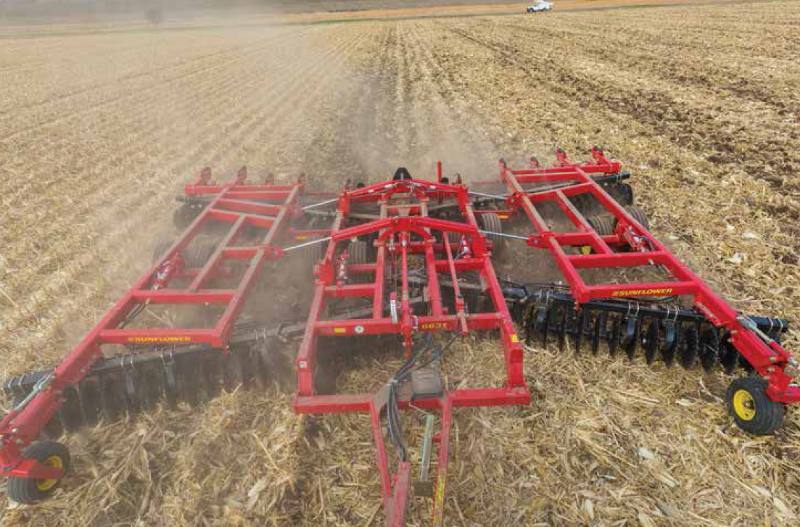 The new 6630 series Vertical Tillage System from Sunflower provides the vertical tillage residue management producers have been seeking but not finding…….. until now. The unique Sunflower Saber blade slices through heavy GMO crop residue sizing and mixing it with soil. This speeds its decay and leaves the field level with the remaining material sized for the planter. The ratios of soil to residue are completely determined by the operating depth of the tool. An operating depth of two inches will produce a sized corn crop residue mixed with enough soil to anchor the residue to protect against erosion by wind or water. Increasing the operating dept will lift more soil and enhance the decomposition process. Each Sunflower Saber blade has twenty-five flutes that are specially designed to fracture and lift the soil. The flutes’ capacity is specifically designed to produce the maximum amount of soil lift without producing clods. This will anchor residue and produce the proper mix to enhance residue decomposition. The high speed condition reels aggressively mix the material, separating solids and fines while firming the soil. The scalloped edge of the Sunflower Saber blade maintains a very effective cutting edge as the blade ages eliminating the need to mechanically grind or roll the blade to restore performance. The 6630 models are available in five sizes from 21’ to 32’ working widths the new 6631 Split-Wing models are available in 35' and 40' widths. All models require approximately 8 - 10 horsepower per foot of cut. Sunflower Saber Blade: This twenty-two inch diameter blade has twenty-five soil lifting flutes and designed with scallops to maintain an effective cutting edge acre after acre. No grinding or rolling necessary to maintain the edge of the Sunflower Saber blade. Trunnion Mounted Bearings: eliminate wear between the bearings and the housing and ensure positive lubrication. As the C-Flex™ bearing standards move, the gang bearings have to constantly realign. On conventional bearing systems the bearing moves within the housing. This eventually leads to wear between the bearing and the housing... then bearing failure, because grease cannot get into the bearing. With the trunnion bearing there is never any wear between the bearing and the housing and there is always positive lubrication. The trunnion bearing features triple lip seals that cannot be damaged by daily greasing and metal washers that protect the seals from being damaged by stocks or material wrapping around the gang shaft. C-Flex™ Bearing Standards: Standard equipment on every Sunflower disc, the C-Flex™ bearing standards absorb disc gang shock created by stumps, rocks and normal discing. This extends the bearing, spool and disc blade life. A bonus feature is the C-Flex's™ ability to clear residue better than conventional rigid standards. The C-Flex™ bearing standards also allow for easy maintenance of the gang assembly. Just remove one bolt and loosen another bolt at each C-Flex™ location and the entire gang can be dropped. All C-Flex™ standards remain in place to assure the gang will be in the correct position when replaced. Unlike competitive machines the trash bars are mounted to the back of the C-Flex™ Standards. This allows the trash bars to react with the gang and not come into contact with the spools or blades. Single Point Depth Control: The single point depth control is conveniently located at the front of the machine for easy access. Large easily read markings indicate the direction of movement for adjusting. Front-mounted Gauge Wheels: A trademark on all flexible Sunflower discs is front-mounted gauge wheels. This important feature prevents the front gangs of the wing frame from gouging, buckling or cutting deeper than the other gangs, promoting a level, ridge or furrow free field. The heavy-duty gauge wheels feature a 5-bolt hub and 8.00 x 10 ply tire. Hydraulic Self-leveling Hitch: Level the disc frame from front to rear with Sunflower's hydraulic self-leveling hitch. This positive adjustment maintains a pre-selected setting regardless of the tillage depth. It features heavy-duty compression springs on each side of the pivot to cushion both front and rear gangs, important when crossing ditches or rough terrain. Maintenance-Free UHMW: Sunflower 6630s are equipped with maintenance-free lift and wing pivot systems. These systems pivot on UHMW polymer sleeves eliminating greasing in the lift, wing and gauge wheel pivots. High Speed Conditioning Reels: The high speed conditioning reels break up clods and root crowns and thoroughly mix the residue with the soil. The engagement pressure of the reel is easily adjusted. Three Year Warranty: The 6630 series features superior engineering and rugged construction that will withstand the test of time. Simply stated, it's the finest vertical tillage equipment available. We're so confident, we place a three year limited warranty on the complete tool including the high speed conditioning reel.